Our dogs are 1st and foremost our Friends and Companions. Secondarily they are conformation show dogs. 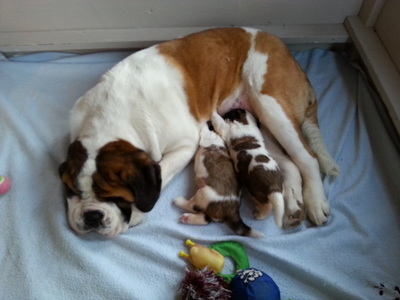 The Saint Bernard breed is our passion, We strive to produce only those dogs who are sound of mind and health. We are very committed to our dogs and work actively with them. Individual time is spent with each of the dogs especially the youngest. The dogs have daily access to a large wooded play yard on a hill and in our home. They are not just stuck in a kennel for life. The play area for them is in the woods on a nicely sloped hill for exercise. 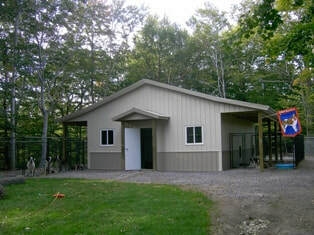 Our building has outdoor access thru doggie doors which the dogs can use at any time day or night. There is running water, electricity and even heat for those unbearable days of winter and huge barn fans to cool them in the summer months. Our goal is for each litter to be better than the last. We continuously aim for correct type, stable temperaments, structural balance and functional correctness. We are eager to share information about our breed and our dogs with you. 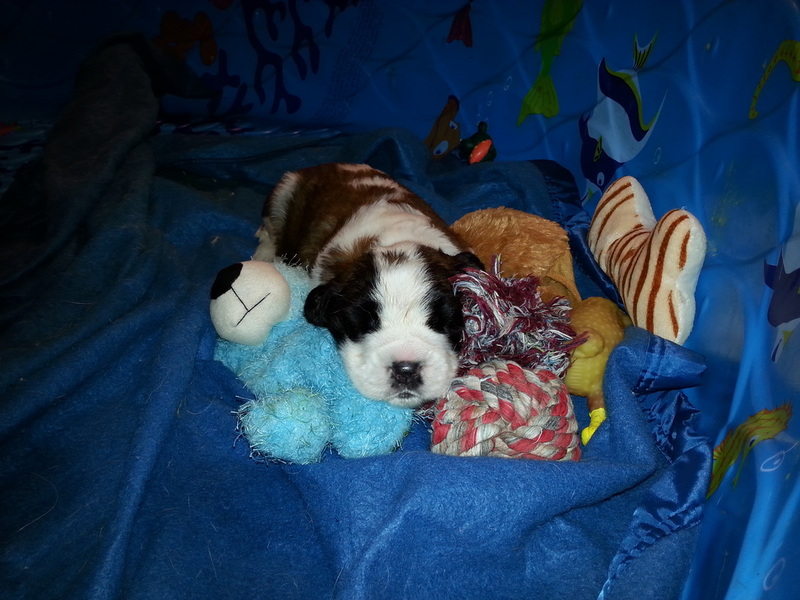 We are interested in the well being of our puppies and want them to be placed in good loving forever companion homes. Time is spent each day with our puppies properly socializing them and working with each one in getting them used to everyday household activities and noises. This process starts on day 3 from birth until they leave us. Following Dr. Carmelo L Battaglia's puppy tactile stimulation and following Puppy Culture where pups are introduced to new brain stimulus each and every day. We encourage visitors of all ages during this critical initial learning period of their lives to come into our home and handle each of the pups. At 7 weeks old puppies are temperament tested using the Wendy Volhard method. At 8 weeks they are evaluated for potential show prospects. Pups can go to their new homes at 8 weeks of age. Puppies that are sold as pets are sold with a 'limited AKC registration' and are to be spayed or neutered. Pups are completely wormed and given their initial vaccination by our licensed veterinarian at Corfu Veterinary Hospital.